Top-grade audio conversion and easy connectivity to computer and iOS systems alike - but at a price. Fantastic audio conversion quality. Attractive, easy to use interface. Now iOS compatible. Apogee's reputation as a supplier of high-quality audio interfaces for Apple computers is second to none. Its product range now offers a broad selection of interface solutions from the extremely compact, single-input One interface, to top-end, fully pro solutions such as Symphony. In this review, we'll be looking at an interface which occupies the middle ground in Apogee's line-up; the Quartet model. Last year, this (along with the Duet) was updated to offer twin functionality, so that it's now at home as a studio interface for computers and as a front-end product for iOS recording to iPads and iPhones. 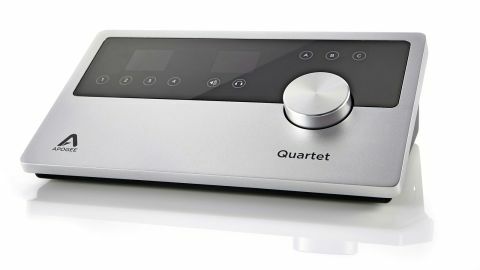 The Quartet interface is an attractively designed desktop wedge which features four high-quality Apogee analogue XLR inputs. When recording, these can accept microphone input sources using Apogee's preamps, or they can be used as line level input sources, bypassing the preamp stage altogether. This is most easily configured through Apogee's Maestro software, meaning that you can use other preamps in your studio as a front-end for your microphones without Quartet further colouring the sound. "Apogee's super-clean, warm preamps offer something hugely desirable to the recording process"
However, for most, Apogee's super-clean, warm preamps will offer something hugely desirable to the recording process. Equally, the analogue channels are just as at home providing Hi-Z Instrument inputs instead. In terms of outputs, Quartet offers six 1/4-inch analogue sockets, thereby supporting 5.1 surround requirements, whilst a side-mounted headphone port is independent of these, meaning a headphone mix can be configured for performing artists separately from your monitor mix. Speaking of monitors, the A, B and C buttons on the upper panel are designed to drive separate pairs of speakers, letting you reference studio nearfields, a main pair, and so on. Working with Quartet is simple - pressing the numbered button for each input then allows you to dial in or reduce gain via the rotary controller, whilst clicking the rotary toggles this input's output feed to the headphone port, thereby either including it or bypassing it from the headphone monitor set-up. Further configuration - input type, phase reverse, phantom power enable etc - can be operated through the Maestro software which simply runs in the background as a middle-manager between Quartet and your DAW. Next to the input number buttons, pressing the Speaker button then allows the rotary to set up output monitor volume, whilst a press of the Headphone button lets you control headphone level. In terms of further physical connectors on the rear panel, you'll find two Optical Inputs for digital connectivity (for ADAT/SMUX interfacing, via Toslink connectors at sample rates between 44.1kHz and 96kHz), a Word Clock output connector and a MIDI Input connector via USB. Apogee make it just as straightforward to use Quartet as a front-end for iOS recording. This requires download of the free Maestro app, which is as easy to use as its desktop counterpart. Before working with software, however, it's necessary to connect Quartet to your iPad and Apogee provide the required cables with a mini-USB connector at the interface end and an iPad 3 or 4 connector at the other (both cable types are included in the box). Then, within the Maestro app, you can choose your input type, dial in gain, configure channels as you wish and you're good to go. All you'll then need is a recording app such as Garageband to allow you to capture your recordings direct to your iPad. Oh, and don't worry about the possibility that your iPad will run out of battery mid-take either, as you'll actually find Quartet charges it once a connection is made. "It's all so simple that emphasis can be placed firmly on music-making alone"
It's all so simple that emphasis can be placed firmly on music-making alone. It's rare to find any hardware/software relationship that is sustained and managed as effortlessly as this one. As you can probably tell, we're hugely impressed by these interfaces. The addition of iOS compatibility is a major step forward for Apogee. It's fair to say this interface currently provides the most ready high-quality recording solution for iPhone and iPad available anywhere right now. However, this much quality, allied to such easy compatibility with both computer and iOS-based systems, comes at a price. Indeed, compared to other interfaces that offer greatly enhanced input/output configurations for significantly less financial outlay, Apogee can seem a disproportionately expensive interface option. As ever, you get what you pay for, and if high-quality preamps, seamless audio conversion, ease of use and simple configuration are key for you, perhaps you won't mind digging a little deeper into your wallet. We doubt you'll be disappointed.